The amount of demolition and destruction which has taken place in Exeter from the late-19th century to the 1970s has been peculiarly extreme: Georgian terraces, numerous medieval townhouses, 15th century churches, 18th century bridges, stretches of the 2nd century city wall, 17th century taverns, 19th century warehouses, roman mosaics, oak panelling, plasterwork ceilings, memorials, churchyards, railings, fanlights, even the Saxon street pattern - almost nothing has been spared, either by German bombs, developers or the city council itself. Along with the (old) London inn and the Half Moon inn, the New London inn was one of Exeter's most important coaching inns throughout the 19th century until it too went the way of so many others and ended up as a pile of rubble. 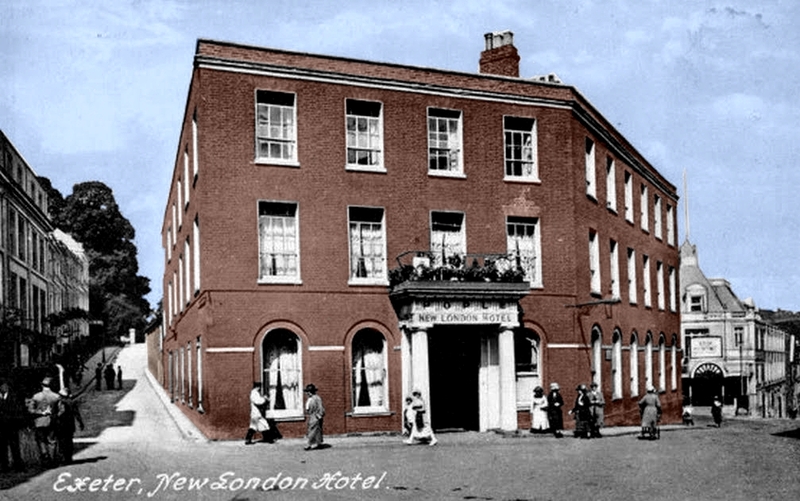 The postcard above shows the New London inn c1900. Northernhay Place to the far left ran up to the public gardens at Northernhay (as it still does). The Theatre Royal on Longbrook Street (demolished in 1962) is in the background to the right. The New London inn was built for John Land, former proprietor of the London inn, on the site of the ancient Oxford inn to designs by Exeter's foremost Georgian architect, Matthew Nosworthy. Nosworthy was already in the process of planning his magnificent terraces in Southernhay, but the New London inn preceded them by a couple of years and was one of his first major contributions to Exeter's cityscape. The Oxford inn was demolished in September 1793 and the New London Inn was completed ten months later in the summer of 1794. The inn was constructed in a small square, later known as London Inn Square, just beyond the boundary of the city wall and at the junction of the High Street, Southernhay, Sidwell Street, Paris Street and Longbrook Street. The map right shows the location of the New London inn in 1905 overlaid onto a modern aerial view of the same area. The inn itself, with its central courtyard, is highlighted in red. The quadrangular plot shown at the rear of the inn, not highlighted, was probably the site of the stables. 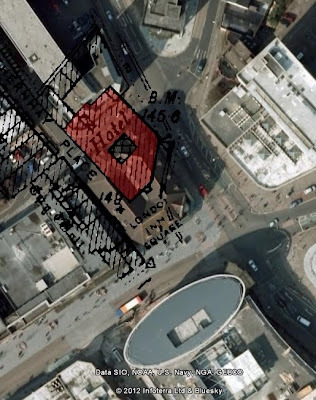 The street plan has been so completely altered by post-war reconstruction that today it's almost impossible to visualise where the New London inn once stood. The former Debenhams building is visible to the far left. The pretentious oval bulk of the new Next building on the corner of Paris Street and the High Street is at the bottom. Southernhay originally exited onto the High Street at a point almost opposite the New London inn until it was rerouted into Paris Street during the post-war rebuilding. The engraving above from 1830 shows the view into the New London Inn Square from the High Street, before the construction of Northernhay Place. 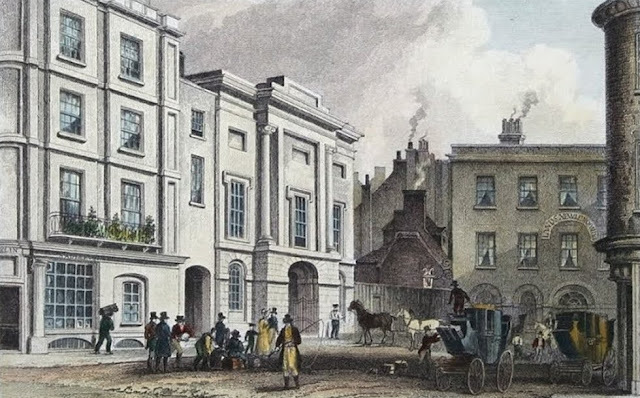 The neo-Classical Subscription Rooms of 1820 are on the left. The New London inn, shown without its pillared entrance porch, is to the right. The New London inn's position provided great ease of access to all the major roads out of Exeter, especially towards London and Bristol. 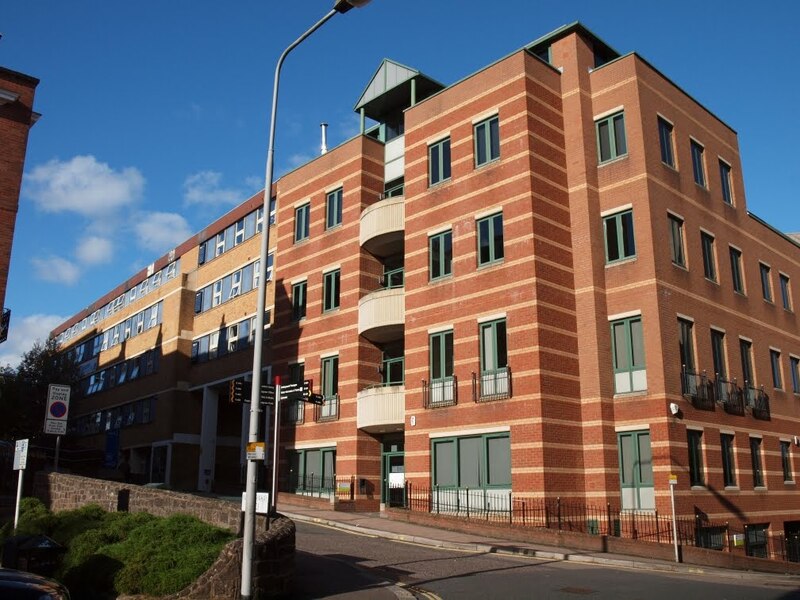 By the end of the 18th century Exeter was still a major city and the regional capital for the south-west of England. Fast transport to the rest of the country was an absolute necessity. The inn quickly became a hive of activity as coaches shuttled in and out of Exeter from all parts of Britain. From here it was possible to take a coach almost anywhere. Many serviced small local towns and villages with mail and stage coaches going out across Devon, to Barnstaple via Tiverton, to Budleigh Salterton, Dawlish and Exmouth, to Falmouth via Okehampton, as well as to Plymouth, Sidmouth, Teignmouth and Torquay. Other coaches provided transport to much larger cities. 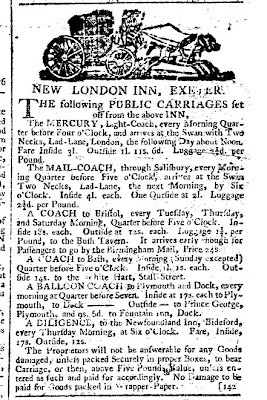 For example, in 1800 the "Mercury" coach departed from the New London inn at 3.45 in the morning and arriving at the charmingly-named Swan with Two Necks Inn at Cheapside, London the following day at noon. The fare cost anything from £1 18s to £3 10s depending on where you sat in the coach. A similar service, called The London Mail went to London via Salisbury. By the 1820s coaches were leaving the New London Inn daily for Bristol, Bath, Southampton and Brighton, with five different coaches travelling to London every day. The "Traveller" coach left the New London inn each morning at 8am and travelled to London via Chard, Crewkerne, Yeovil, Sherborne, Shaftesbury and Salisbury before arriving in the capital at noon the following day. At its busiest the Inn would see as many as 70 coaches arriving or departing within a single day. 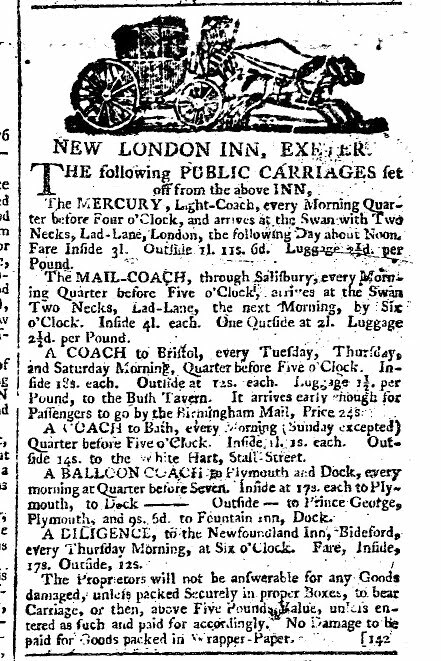 Something extraordinary happened to the Exeter mail coach service known as "Quicksilver" on the night of 20 October 1816. Having left the New London inn with bags of mail, the coach headed towards London and by evening had arrived at Winterslow Hut, seven miles from Salisbury. As the coachman pulled up outside the Pheasant Inn one of the lead horses was attacked by a lioness, the blood "flying as if a vein had been opened by a lancet". The panic of the other horses nearly overturned the coach itself. Two passengers inside the coach sprang out in terror and ran into the Pheasant Inn, locking themselves in an upstairs room. A large mastiff ran out from the inn's yard and launched itself at the lion, causing the lion to release the horse and pursue the dog. The lion was eventually cornered beneath a granary. It had escaped from a travelling menagerie that was camping nearby. When the lion's keeper arrived both he and some assistants crawled beneath the granary with a large sack, captured the lion, tied it up and took it back to the camp. A replacement horse was found and the mail coach resumed its journey having lost only 45 minutes from its schedule. This incident was recalled in a stamp issued by the Royal Mail in 1984 and shown above left. Anyway, back in Exeter and Nosworthy designed the New London inn with spacious accommodation spread over three floors. Like the terraces in Southernhay and Dix's Field, the inn was constructed from locally-fired red bricks. Pedestrian access into the High Street and New London Inn Square was through a simple portico supported by two fluted columns and two fluted pilasters. This must've been a later addition as an engraving from 1830 shows the facade of the inn with only an arched entrance. The floor plan consisted of a quadrangle, with the accommodation constructed around a central cobbled courtyard. 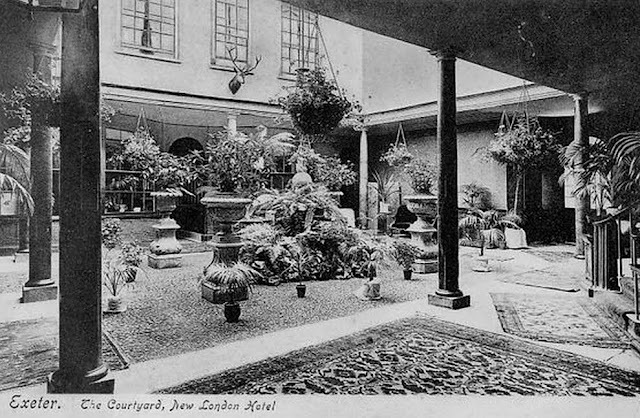 The service part of the Inn was at the rear with stabling for the horses and large gates which allowed entry into the courtyard for the delivery of goods and the collection of luggage and mail sacks. By the close of the 19th century the courtyard had received a glass roof and was furnished with rugs, tables, chairs, palms and ferns to provide a lounge area above. Supporting the upper floors were a series of slender, marbled columns. Running around the entire courtyard was a decorative frieze. Nosworthy gave the exterior elevations some interest with the use of arched windows on the ground floor with simpler rectangular windows above. A string course, probably made from Coadestone, ran across the facade at ground floor level. Comparison with Nosworthy's surviving work in Southernhay shows the consistency of his architectural style. 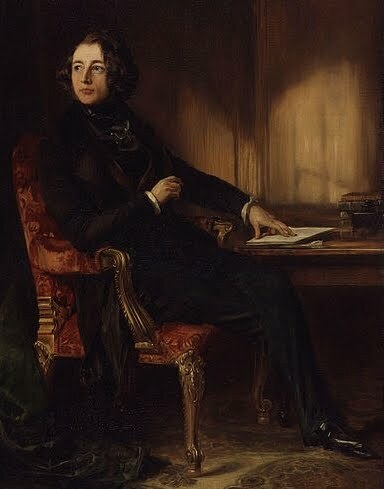 An early visitor to the New London inn was the Romantic poet and future Poet Laureate, Robert Southey. Probably best-known today for his biography of Nelson, he stayed at the inn in 1802. He was less than enamoured with the city of Exeter itself, praising the High Street but referring to the rest as nothing but "dirty lanes" and having the "unsavoury odour of Lisbon", but he was impressed with the New London inn. He wrote: "At length we crossed the river Exe by a respectable bridge, and immediately entered the city of Exeter, and drove up a long street to an inn as large as a large convent. 'Is it possible' I asked [the coachman], 'that this immense house can ever be filled with travellers?'". Southey continued his observations in a letter the following day, dated Saturday 24 April 1802: "If the outside of this New London inn, as it is called, surprised me, I was was far more surprised at the interior". He goes on to cite the "sofa in the apartment" and the "sideboard...set forth with china and plate", noting that none of these were essential for travelling and would probably only add to the cost of his stay. Another literary guest was Charles Dickens above left c1839, who stayed at the New London inn in March 1839 whilst looking for a house for his parents. In a letter he wrote from the inn Dickens said that "my quarters are excellent", praising the head waiter for the good service he received. (Dickens did indeed find a house for his parents in Exeter, "about a mile beyond the city on the Plymouth Road" in what he called "this most beautiful of English counties". The house, incredibly, still stands today in Alphington). Other notable visitors included the Duke of Wellington, the Prince of Wales (later Edward VII), H Rider Haggard, George V, Beatrix Potter and Robert Louis Stevenson. Stevenson had been detained at the inn by illness for several weeks in September 1885. Upon leaving he wrote in the visitors' book: "I cannot go without recording my obligations to everyone in the house: if it is your fate to fall sick at an inn, pray heaven it may be the New London!". Jane Austen mentions the inn in chapter 47 of 'Sense and Sensibility'. 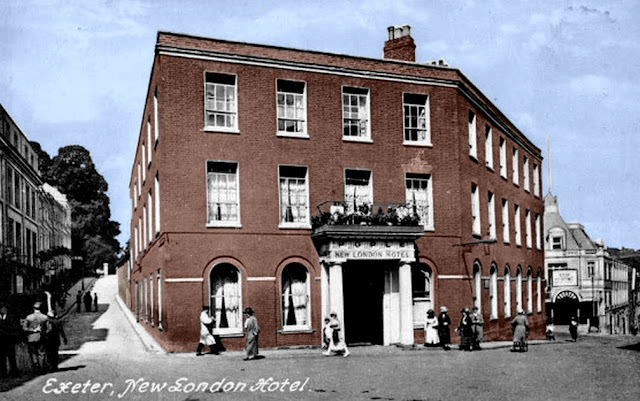 For service, food, convenience and accommodation, the New London inn was one of the finest inns in south-west England. When John Land died in 1817 aged 86 his obituary stated that he was "the oldest, and supposed to be nearly the richest, inn-keeper in the kingdom". The inn had various proprietors throughout the 19th century but in 1935 it was purchased by Associated British Cinemas and just five months later, in 1936, the entire building was demolished to construct the Savoy, later the ABC cinema. The photograph right © Devon County Council shows the The Savoy cinema after the bombing raid of 04 May 1942, which it somehow managed to survive. The Theatre Royal is on the left. 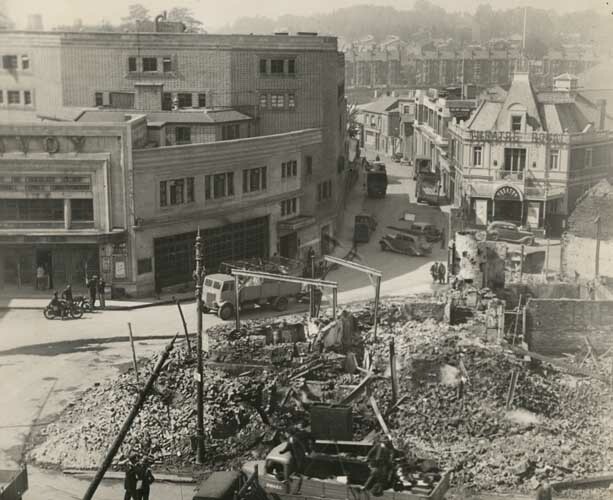 Between the Theatre and the cinema is New North Road. In his book, 'Aspects of Exeter', Peter Thomas reports how the decision to destroy the 18th century inn was met with anger in some quarters, with one citizen writing at the time saying: "It seems incredible that anyone should be guilty of such vandalism", deploring the "ruthless destruction". As Peter Thomas states: "Such sentiments are traditionally the losers in Exeter when there is hope of replacing an old building with some money-making structure". And so the inn came down. 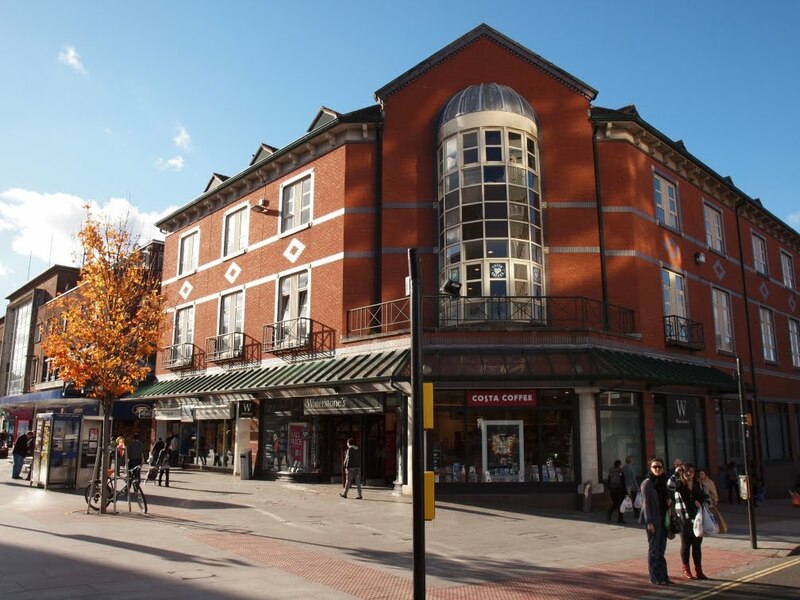 Ironically, and unlike almost everything else in the vicinity, the ABC cinema survived World War Two unscathed but was itself demolished in 1987, being replaced with an almost equally charmless bookshop. Today nothing remains of either the New London inn or the square which was named after it. The two photographs below show what the site of the New London inn looks like today. Much of the site is under Bailey Street which was forced through from New North Road and Longbrook Street during the post-war reconstruction. The first building sits almost on top of what was London Inn Square itself. The second shows one side of Northernhay Place as it rises towards Northernhay Gardens, the same road visible in the photograph at the top of this post. In 1877 the New London Inn bought the Sellers Coach Manufactory which backed onto the New London Inn. I cannot find the link, but this was in the Exeter Flying Post. It was sold by my Great Great Great Grandfather (John Alexander Sellers) after his son died in 1876. (also John Alexander Sellers) My great, great Grandfather was too young to run a coachworks so effectively no heir was left to carry the business on. He died in 1879 and my great grandfatheoubr (John Alexander Rounsiful Sellers) was able to live as a gentleman of independent means until the money ran out. I am still trying to work out the position of the coachworks as it also fronted or backed onto Bedford and Catherine Street and possibly Egypt Lane and may even have been visible from the High Street (where Ann Sellers kept a baby linen warehouse (originally in North Street.) Would this confirm the site of the stabling? Odd to think part of the family fortune, before my great grandfather drank it away (or so family tradition has it,) was realised by the sale of the New London Inn! I will post back when I find the other information I have. I know I have seen what they paid. The auction took place on 14th November 1877. Therefore that would be the date the New London Inn acquired the coach works. It was a going concern, so one wonders what they did with all the coaches!